Eyeglasses / Sunglasses Repair Now Available !!! Eyeglassdirect.com is the nation wide leader in top quality repair of eyeglasses and sunglasses. Due to everyday wear and tear your glasses can become loose, crooked or out of alignment. Eyeglassesdirect.com can repair all types of repairs on all types of glasses. We know the values of glasses that you had invested in and our professional staff will help you get your glasses back in shape. Our technicians can perform all types of repairs, with the most common repairs such as: Lens Replacements, Metal Frames Repairs, Plastic Frames Repairs, Screw replacements, and Scratch Removals. Our repair work is performed on-site by our experienced technicians, who have successfully completed a number of eyeglass and sunglass repairs. During any time of the repair process, we will keep you up to date, and when you do have questions, you can simply connect to one of our professional customer service agent who will get you on your way. To get started, simply fill out the form either on the bottom of the page and follow the instructions. The best part is all repair starts at $35 and includes FREE shipping to Eyeglassdirect. 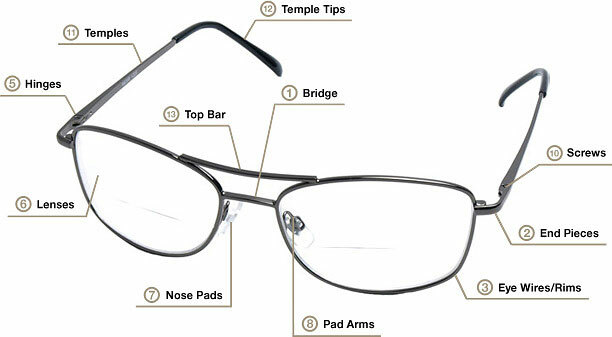 To get a better understanding of what is broken, CLICK HERE, for a diagram of the parts that makes up a pair of glasses. No matter what material your glasses uses or what is broken we can repair them. Either use this automated repair setup process, or contact one of our agents and get started today on getting your glasses back in shape! Eyeglassdirect warrants our eyeglass repair services for 60 days againist defects in material and craftsmanship. Eyeglassdirect will only warrant parts of the eyeglass which were serviced by us, and this warranty does not extend to other parts of the eyeglass which we did not service.